Harappan civilization is one of the most ancient civilizations of the world. It was believed to be a hub of art and culture and architecture. The discoveries made at these architectural sights give us great insight into the lives and lifestyles of our ancestors. Let us learn about this very important part of our history. Harappa is known to be a 4700 years old city in the subcontinent which was discovered around the time 1920. Soon after the discovery of cities like Lothal, Dholavira, Mohenjodaro, and Kalibangan have also been discovered and were come to be known as the Harappan cities or also the advent of Harappan Civilization. These cities were discovered around the river Indus, henceforth proving the existence of the Indus Valley Civilization. The Harappan city was divided into two or more parts of which the part to the west was smaller, however higher, known to be as a citadel. Also, the part to the east was comparatively larger but lower and the archaeologists called it ‘the lower town’. The citadel comprised granaries, religious buildings, public buildings, and assembly halls while the lower town was divided into rectangular sections cut by wide roads at right angles to each other. Harappan objects were made of stone, Shell, and metal. Copper and bronze were used to make tools, weapons, ornaments, and vessels. Gold and silver were used to make ornaments and vessels. Harappans also made stone seals. They made pots with beautiful black designs. Bricks were so well made that they had seemed to have lasted for thousands of years and were laid in an interlocking pattern which made the walls strong. About a hundred and fifty years ago, many of these bricks were taken away by engineers. People built one or two-story houses on either side of the roads with rooms built around a courtyard. 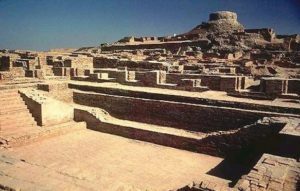 The Harappan city had a well-planned drainage system where every house had a drain connected to the street drains which further were connected to the bigger drains. The drains were also covered with the stone slabs that were laid in straight lines along with inspection holes for the cleanup purpose. Harappans grew wheat, barley, pulses, peas, rice, sesame, linseed, and mustard. They also developed some new tools known as plough and was used to dig earth for planting the seeds and turning the soil. A method of irrigation was used due to less rainfall. The Harappan reared cattle sheep, goat, and buffalo. Water and pastures were present around many sites. People collected fruits, fish and hunted wild animals. Mohenjodaro, Harappa, and Lothal also had huge storehouses used for storing grains and hence were called granaries. Big fire altars are found at Kalibangan and Lothal used for performing sacrifices. Lothal also has revealed a huge dockyard for the loading and unloading of goods. Q: Describe the people of Harappan cities. Ans. There were three basic occupations of people living in Harappan cities. They planned the construction of special buildings in the city. They probably sent people to distant lands to get raw material. And they kept the most valuable objects for themselves. Scribes were people who knew how to write. They prepared the seals. Crafts-persons. People who made all kinds of things were calledCraftspersonss. Some farmers and herders also lived outside the city helping with food to the people. Q: What could have been the possible reasons behind the end of the Harappan civilization? Ans. The Harappan civilization suddenly seems to have started to end around 3900 years ago. People stopped living in many cities. Writing seals and weights became extinct. Raw materials were now rarely imported. Some scholar says that it is due to the drying of rivers while some have explained it to the cause of deforestation. In some areas, there were floods that have been the main reason due to which the rulers have lost control. The people have consequently abandoned Sind and Punjab and had moved to the newer smaller settlements to the east and the south.